We believe it takes an individualized approach, customized to meet your specific requirements, to deliver the most effective pharmacy care. We serve the individual needs of both large and small facilities by providing a wide range of products and services. We respond promptly to staff and resident needs. We recognize that each facility is unique, and our pharmacy professionals are trained to meet your specialized needs and exceed your expectations. Prior to the first day of service, we partner with facility staff to collect physician orders and insurance documentation; test interfaces with our pharmacy document management system; deliver medication carts and provide emergency medication access equipment to meet each facility’s unique needs. To prepare facility staff for a seamless transition to our pharmacy services, several weeks before we begin deliveries, our pharmacy staff provides in-service training (proper use of forms; use of our online pharmacy computer system; medication delivery protocols, review of delivery schedule). And, periodically our pharmacy staff meets with facility staff to provide customer support services. Guardian Pharmacy of Maine utilizes state-of-the-art barcode technology and computerized workflow tracking with a series of checks and balances to assure timely and accurate medication dispensing. A pharmacist reviews all new orders and supervises our pharmacy technicians during the medication order receipt and dispensing processes. A second pharmacist scans completed medications to verify pharmacy technicians have accurately filled each prescription. A third scan of all dispensed medications is completed by our delivery staff to ensure all medication requests are being delivered to the correct facility and resident. We use a paperless document management system designed specifically for pharmacy medication orders. Our pharmacy system removes paper from the pharmacy, increases productivity and improves customer service. For example, a thumbnail confirmation fax is sent to facility staff each time we receive an order. We utilize multiple eMAR interface products to allow facility staff to electronically submit medication refill requests, increase productivity in their facility and facilitate accurate, timely medication dispensing. Our newest technology, FrameworkLink is a more direct and inclusive system. It allows facility staff to track “in real time” all medication requests in our pharmacy document management system, submit medication refill requests, review resident medication profiles, monitor progress from order receipt to delivery, and avoid time-consuming telephone or fax communications. Guardian Pharmacy of Maine employs its own delivery staff, and our employees make timely routine deliveries to residential facilities 7days/ week; 365 days/ year. Medication changes are included in daily deliveries, and each scheduled delivery includes consolidated delivery sheets with resident name, medications delivered and quantities delivered. Our delivery services are an important part of our overall quality of service, and our Management Team is convinced employing our own delivery staff sets us apart from our competitors. Guardian Pharmacy of Maine pharmacists are cross-trained to dispense medications in our long term care pharmacy and to provide customized pharmacy consulting services onsite in residential facilities. They spend about equal time each month in pharmacy operations and in residential facilities. In both roles, they work closely with physicians and facility staff to ensure the safety and efficacy of medications. Pharmacist onsite visits include a medication chart review for each resident. Consultant pharmacists make clinical recommendations to physicians and/ or facility staff and provide medication trend-analysis reporting for the facility. Onsite consultant pharmacist services comply with or exceed all state and federal regulations. In addition, consultant pharmacists may also participate in facility committees, clinical or operational in-services, state pre-surveys, problem-solving consults and system development. Crossed-trained pharmacists with pharmacy operations and onsite facility consulting expertise deliver the excellent service you deserve by maintaining an unwavering focus on service, patient safety, and continuity of care. 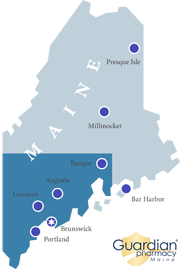 Guardian Pharmacy of Maine strives to provide the highest quality long term care pharmacy services including IV infusion therapy and compounding services to meet the special needs of patients requiring additional care. IV therapies are most frequently used by patients to avoid potentially life-threatening infections or to provide end-of-life pain management. Our customized compounding products provide facility staff with cost effective and alternate administration options to meet patient-specific needs. Guardian Pharmacy of Maine provides pharmacy services from a complete-service perspective, and we understand medication questions and emergencies may arise after our long term care pharmacy has closed. In an emergency, an on-call pharmacist is available to answer questions and dispense medications 24hrs/ day and 7 days/ week. Facility staff may also have immediate access to emergency medications via an automated medication dispense system or a customized supply of emergency medications provided onsite to residential facilities by our pharmacy. Guardian Pharmacy of Maine combines the spirit of a local pharmacy with the technology and resources of a national healthcare organization to support the unique business objectives of the residential facilities we serve. The qualitative facility management objectives we seek to reinforce are efficiency, superior care, staff proficiency and consistency of management. Facility staff are constantly challenged by changing technology, medication delivery systems and regulations. In consultation with facility staff, our pharmacy staff provide onsite customized education programs and in-services. Residential care facilities can utilize our pharmacy staff in-services to keep abreast of changes and to maintain the highest level of care for residents. Guardian Pharmacy of Maine understands accurate billing is a major component of customer service for our facilities, for residents and for their families. Our billing specialists are available in our pharmacy to resolve billing questions weekdays from 9AM – 5 PM. Our billing specialists are highly trained in all aspects of insurance and Medicare claims processing. They work to maximize the benefits residents receive from their prescription insurance coverage and to provide prompt, courteous and informative support to facility representatives, residents and families. Guardian Pharmacy of Maine strives to provide exceptional customer service and personal contact to meet customer-specific expectations. We provide a full range of services – dispensing and consulting pharmacy services, infusion therapy, compounding services, emergency on-call pharmacist support, access to emergency medications, the highest level of accuracy when dispensing medications (state-of-the-art bar code technology and blister card packaging), routine daily deliveries, education programs for your staff, billing specialist support and many more services. We provide clinical support, onsite consulting or dispensing pharmacy services, and partner with facility staff to provide outstanding care for residents.